It’s mid June and it’s really freaking cold out here in Boston. Plus it’s been raining non stop. I am not happy about this. Not happy at all. To me early June is all about stretching our legs to get ready for the summer BBQ blitz that is going take us through July, August, and sliding into September. It’s all about long summer days, flip flops, sand feet, paper bags of fresh corn from the farmer’s market, and icy cold beers. I’m clearly ready for summer but the weather outside isn’t there yet. So disappointing! Plus, even more disappointing than crappy cold weather now is the fact that I’ve outgrown going to camp. Seriously, I think about it all the time. I wish camp was an any age activity. Wouldn’t that just be so great? I spent 5 summers going to camp where I played 4-square, put on plays, wove many little baskets and friendship bracelets, and sailed around the lake. I even rode a horse for a few years and his name was Cadillac. Loved him! Plus, there was a little camp store and in the afternoons we could get snacks, drinks, camp Tshirts, and stamps to send out letters home. Well, my go to special treat on hot days were frozen snickers.Nothing beats a cold treat on a super hot day. So our group of us would hit up the store right after lunch, get our goodies for the afternoon and then book it over to the 4-square court. See, why I want to go back so badly?!?! 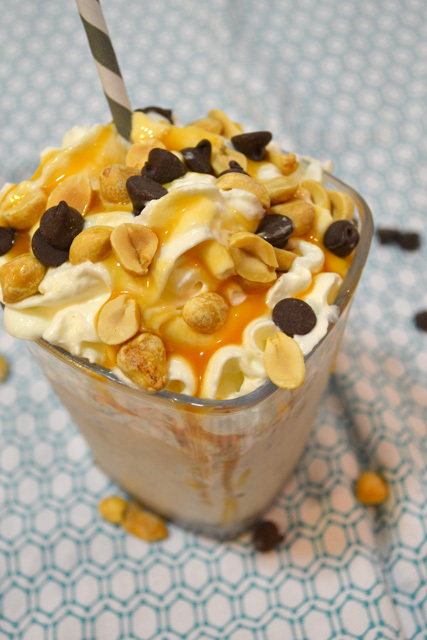 Well Amanda and I both had peanut butter on the mind for this week’s candy themed week of our milkshake month since she did a fun Reese’s Pieces Milkshake! They are my favorite movie theater snack so I would just love one myself. Enjoy! Combine the ice cream, milk, chocolate chips in a blender and mix until combined and the chocolate chips are all smashed up to teeny tiny bits. 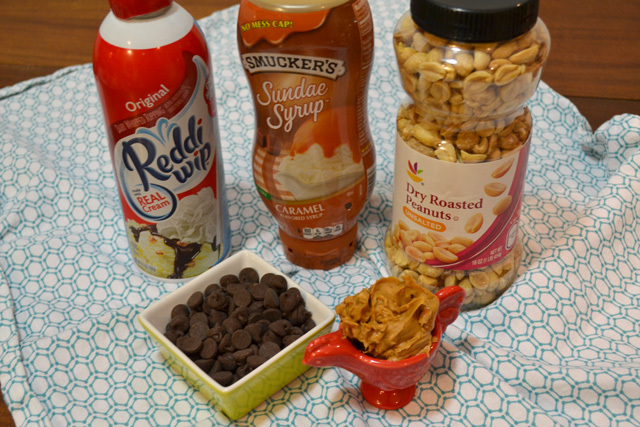 Add in the peanut butter and caramel sauce and give it another blend to combine. Garnish (heavily) with whipped cream, caramel sauce, chocolate chips, and peanuts. I was thinking about camp the other day! I’m dying to do some rafting while we’re in Colorado and haven’t done any since my camp days! Those were the good ol’ days. I love this shake! 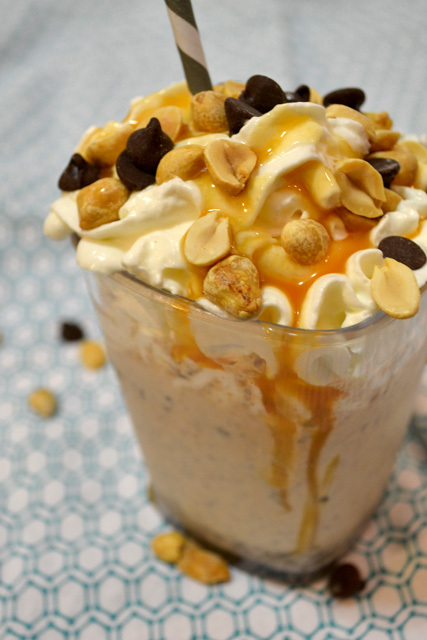 Peanut butter and caramel… yes please! 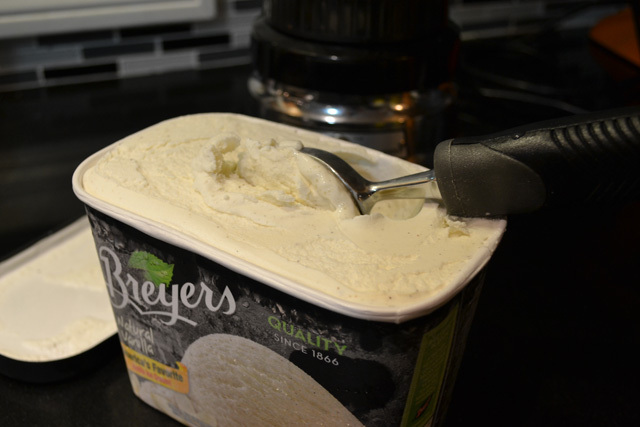 Is this low carb? Even if it is not, it still looks terrific!